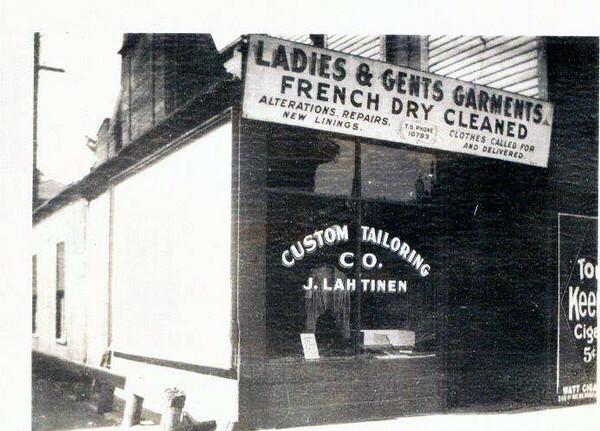 Mark Lahtinen posted the following text on Facebook accompanying above photo: ""My great grandfather's tailoring business. On Glenwood Ave. I think and I don't know what year. Note sign next door on the right. ... Not sure on the address but I have access to some City directories from a cousin to look at although I don't know the year either. ... The addresses listed from 1897 through 1920 were 106 Plymouth ('97 - '98), 77 south 10th St (not N. side sorry - 1906-1914), then 233 Humboldt which was his house. To me it doesn't look like 233 with the apparent cigar store next door. Not sure, CD copy so I can't see if there's a date on the back. I'll see if my cousin has the original."" Some activities were intended to raise American consciousness of Finland's plight. Finnish Americans spoke to civic groups and appeared on the radio and in newspapers. Finland's ambassador to the United States, Hjalmar Procope, made a widely publicized visit. The entire Twin Cities community, including many luminaries who came to Finntown in large black limousines, became interested in "little" Finland. Other activities were intended to raise funds. The churches ran a series of "silver teas." Benefit concerts were given. People with "Help Finland" cans were posted on street corners; others passed cans during movie intermissions. Within two months, Finntown's "Helping Hand to Finland" raised $20,000. Clothing, bedding and surgical materials were also collected. In February, at "Minneapolis's biggest baby shower," nearly a score of tables were piled high with garments "for tiny tots" at Wells Memorial. These activities energized Finntown. When it was over, realizing they had created a new level of ethnic identity, they reorganized as a cultural organization, the Finnish American Heritage Society, and sponsored ethnic activities: "pikku Joulu" (Christmas) parties, "kesajuhlat" (summer festival) concerts, touring groups from Finland. By the end of World War II, Arne Halonen had convinced the University of Minnesota to offer Finnish language classes. During the 1950s, the society participated in the International Institute Festival of Nations. And in 1958, the Minnesota Finnish American Historical Society installed a monument to Minnesota's Finnish pioneers in nearby Glenwood Park. Throughout it all, the good spirit and leadership from "Helping Hand to Finland" kept Finntown uppermost in Finnish Americans' minds. But although Finntown was blessed with the arrival of new immigrants, refugees from wartorn Finland like Leo Liiste and Lennart Liiste, Finntown continued to decline. When the Humboldt Avenue Finnish Apostolic Lutheran Church closed its doors and moved to 4th and Newton in 1962, the final disintegration was clear. Although the church didn't move very far, it only stayed in the neighborhood for sentimental reasons and it later moved to the suburbs as the other Laestadian churches had already done. Finntown is gone but Finntown life goes on. As many as 4,000 people still belong to eight Laestadian churches in Plymouth, Minnetonka, Crystal, Golden Valley, Brooklyn Center, Osseo and Blaine. Tuuliiki Sinks, and her recruits, teach as many as eight sections of adult Finnish-language evening classes to the eager descendants of Finnish immigrants. Salolampi, the children's Finnish-language camp, is included within the Concordia Language Village program. The Minneapolis Public Schools "Ethnic Studies Project" includes a Finnish Studies unit. the Center for Finnish Studies at the University of Minnesota offers undergraduate degrees in Finnish Studies and is developing a graduate program. Twin Cities Finnish Americans provide significant leadership to the national Finnish American community. FinnFest USA, a national festival held annually, began here in 1983. Finnish Americana, a nationally distributed annual featuring history and creative writing about Finnish America, is published in St. Paul. Kisarit, based in St. Paul, is the nation's leading Finnish dance group, and Koivun Kaiku, based in Minneapolis, is the only kantele performance group in the nation. (The kantele is a Finnish stringed instrument.) The Finnish American Archives at the University's Immigration History Research Center leads some to call the Twin Cities the center of Finnish American intellectual activity in the United States. The existence of all of these organizations, classes, events and publications suggests that Finntown has been reincarnated in a new, more geographically dispersed form and that Finnish American ethnicity is alive and well in the Twin Cities. 1. The History of the Finns in Minnesota, Hans R. Wasastjerna, editor, (Duluth, 1957), includes twelve pages on the Finns in Minneapolis (pp. 117-129), mainly translations of primary sources including the published histories of Salomon Ilmonen and Elis Sulkanen. An unpublished primary source history by John Sala is included in the WPA papers in the Minnesota Historical Society Collection. 2. Calumet Finnish Women's Society First Calendar, Calumet, Michigan, 1896, p. 3. K. Marianne Wargelin, a Humanities and American Studies instructor at Anoka-Ramsey State Community College, researches and writes about Finnish Americans. Her published work includes articles on women, theater and folklore. She is co-editor of "Women Who Dare"- "The History of Finnish American Women" and was the American chair of the Reunion of Sisters Project, a three-year program of exchange with women of Finland. She first became interested in Finntown when co-directing "Courageous Enough: A Photo History of Finnish American Women," funded by the Minnesota Humanities Commission. - - - Above text from article "Finntown, Minneapolis: An American Neighborhood" by K. Marianne Wargelin - published in the Fall 1988 issue of 'Hennepin County History' magazine.